eD@HoMe: 3 awesome covers for today! Recently, I purchased a number of wonderful covers on the eBay. And here are 3 lovely ones. 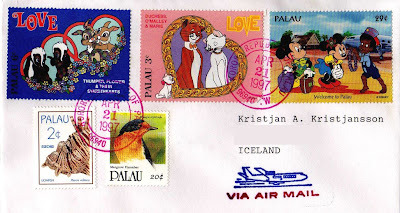 The first cover was sent from Palau to Iceland. 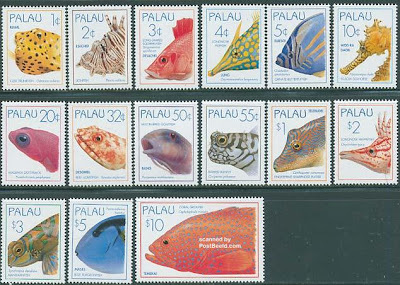 This lovely cover was postmarked on 21 April 1997 in Palau's largest city, Koror. Situated some 800 km east of the Philippines and 3,200 km south of Tokyo, Palau is one of the world's youngest and smallest nations. This westernmost cluster of the Caroline Islands gained independence in 1994. 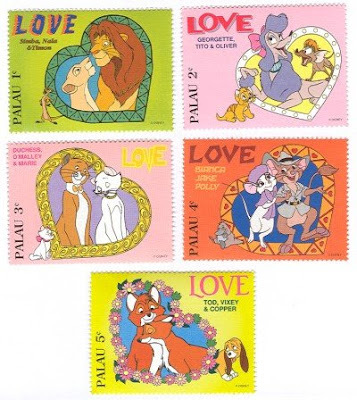 The first two stamps franked on the top row are from the "Disney Stamps, 1996 Love" series. The stamps in this beautiful set show Simba, Nala, and Timon from The Lion King (1c); Georgette, Tito, and Oliver from Oliver & Company (2c); Duchess, O'Malley, and Marie from The Aristocats (3c); Bianca, Jake, and Polly from The Rescuers Down Under (4c); Tod, Vixey, and Copper from The Fox and the Hound (5c). These were issued on 30 May 1996. 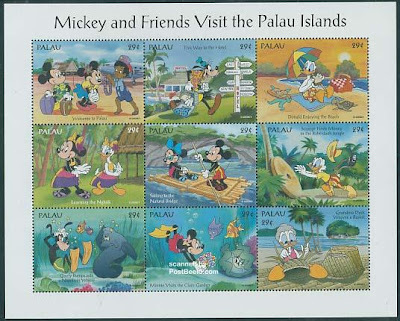 Next, is a stamp from the "Mickey and friends visit the Palau Islands" series. It was issued in 1994. 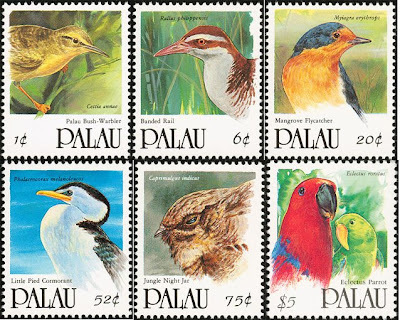 The stamps franked on the bottom row belong to the "Fishes" definitive series and "Birds" series. These were issued in 1995 and 1992 respectively. 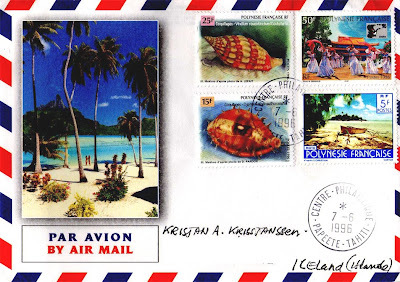 The second lovely cover was sent from the French Polynesia to Iceland on 7th June 1996. 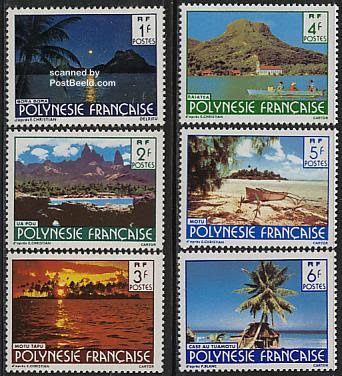 French Polynesia is a French overseas collectivity in the southern Pacific Ocean. It is made up of several groups of Polynesian islands (118 islands), the most famous island being Tahiti in the Society Islands group, which is also the most populous island and the seat of the capital of the territory (Papeete). 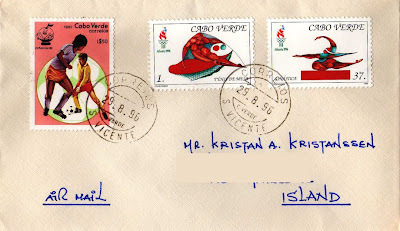 The 2 stamps franked on the first half of the cover belong to the "Shells" series, issued in 1996. 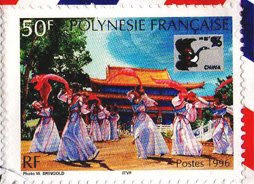 The stamp franked on the top right corner was issued in 1996 to commemorate the China International Philatelic Exhibition. Last but not least, we have a stamp from the "Scenic Views" series. It was issued in 1979. The final cover for today was sent from Cape Verde to Iceland. It was postmarked in São Vicente on 29th August 1996. The Republic of Cape Verde, is an island country, spanning an archipelago located in the Macaronesia ecoregion of the North Atlantic Ocean, off the western coast of Africa. The previously uninhabited islands were discovered and colonized by the Portuguese in the fifteenth century, and attained independence from Portugal in 1975. 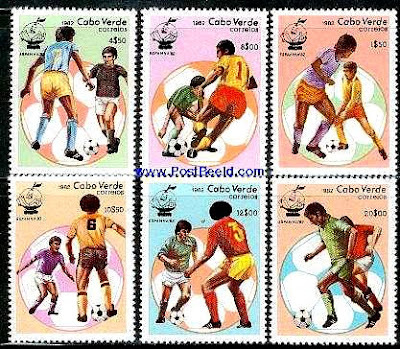 The first stamp franked on this awesome cover belongs to a set of 6 lovely stamps from the "World Cup" series, issued in 1982. 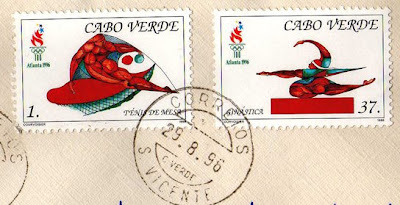 Like many other countries around the world, Cape Verde Postal administration issued a set of stamps to commemorate the 1996 Atlanta Olympic Games. Two of these stamps can be seen on this lovely cover. Hope you'll enjoy these covers. Till next post!